Well this is interesting. 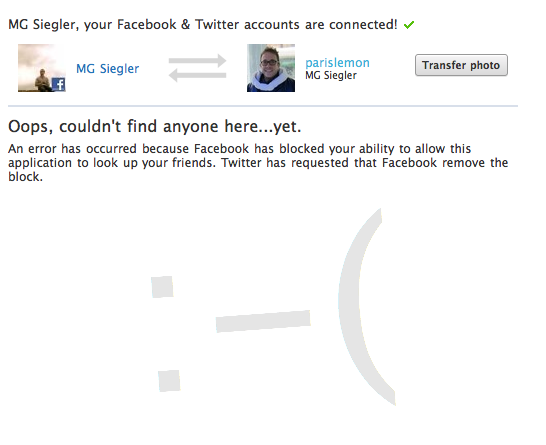 No sooner do we post about Twitter’s new ability to look up friends on Facebook, does Facebook block the app. It’s not yet clear if this block is intentional or if it was simply getting hit too quickly and they automatically pulled the plug. Oops, couldn’t find anyone here…yet. An error has occurred because Facebook has blocked your ability to allow this application to look up your friends. Twitter has requested that Facebook remove the block. Twitter is in the process of finding out what is going on. And we have an inquiry into Facebook. Obviously, we’ll update when we know more. Twitter and Facebook have had an interesting/contentious relationship over the years. Facebook tried to acquired the company in late 2008, and when that failed, Facebook features mysteriously started to look more like Twitter. Facebook CEO Mark Zuckerberg recently admitted he was too focused on Twitter in the past when he saw their fast growth. Facebook was also hugely underreporting the number of users using the Twitter app until very recently. The Twitter app on Facebook is a top 40 app. So it doesn’t appear that Facebook is blocking this intentionally.